thanks for these great stuff. AG, what comp circuit is the based from? Do you thinks it's a modded Dyna? Dave (Barber) is one of the nicest guys you'll ever talk to. I don't see HOW in the world he makes a living building such great pedals at such a low price, but IMO if you have an inclination to own one, buy it - it's worth it! With that said, Dave posted on TGP (IIRC) that it is indeed the ross type circuit with an additional inverting opamp stage on the end. My gut says it probably is a blending circuit very very similar to the sparkledrive, especially since the blend is a dual pot. I should also note that I'm getting ready to release a compressor with a clean blend that is similar but a different blend circuit and I'm putting a high boost stage on the end. If you get a chance, give it a try - it's good tones! Looking at that picture, there is just the OTA and no op-amp, Barber site says FETs are handling the dry and blend, but it could be anything! very well could be - I was just basing my post off of one that Dave posted a while back on a forum. It actually may have been diystompboxes.com that posted at, I don't recall. I know the one I'm working on is a ross type circuit with an inverting opamp stage that mixes the cleans similar to the sparkledrive. After that is a tonestack that is a little similar to the tubescreamer tonestack, except it is a 25k pot, lugs 1 and 3 connecting to pins 1 and 2 on the opamp, lug 2 on the pot connects to a .0047uf. I don't think barber has the same thing going on, but the function is probably similar minus the tonestack. I hear ya, I know how forums can be, so easy to misunderstand something..not to mention trying to remember who said what. I was pretty intrigued by the ability to mix in the clean signal (well, and the price, too). I guess my main issue with the pedal is that it seems to raise the noise floor as your note decays. So the sound is pristine until you let a note sustain and the hiss rises up to meet you, which is fine if you're not looking for it to act as a sustainer. Any thoughts on why that is and how to potentially correct it? OrionManMatt wrote: Any current news on this? That's *any* pedal compressor. Everything gets boosted along with the signal, including any background hiss. 3 posts from the man himself, mark hammer, about it. And who is this Mark guy? I've actually been looking at his Tangerine Peeler, some OS clones, and trying to think about applying the clean mix of the Barber Tone Press, et al. Thanks for reminding me of that point. I suppose the very thing that is so nice about the Barber is what makes me forget for a second what the pedal is. Or something like that. Not sure I can quite elucidate what thought is going through my head right now, but it's certainly one that's making me say "D'oh." 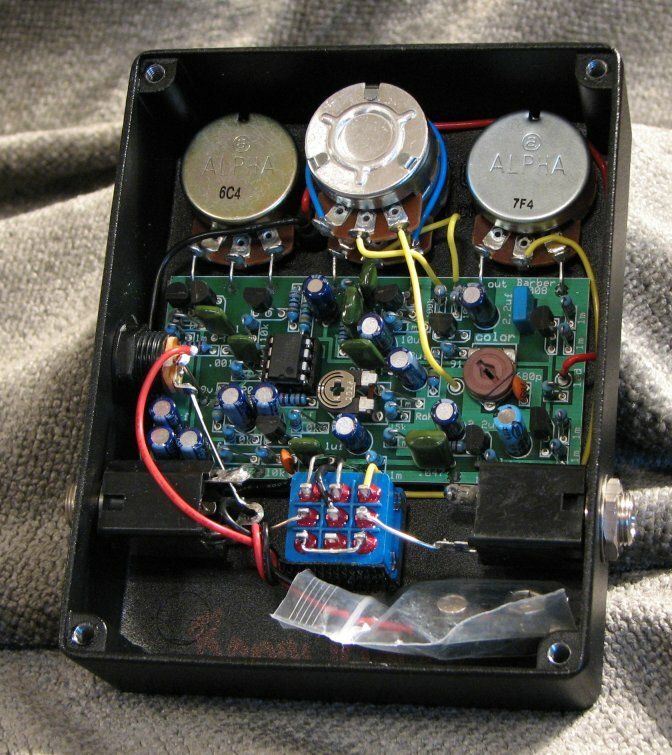 Does anyone has the schematic and/or layout from this pedal? No schematic but here are some nice gut shots and corresponding discussion. Is it really so hard to use the search-button before starting a new topic concerning the same pedal ? Is that a 3080 inside the tonepress? The BYOC Dynacomp/Ross kit has a blend control. It also has Tone and Attack controls. It's a very nice sounding and versatile pedal. DOES ANYONE KNOW barber tone press Schematics? Re: DOES ANYONE KNOW barber tone press Schematics? And, unfortunately, there's no schematic, yet. Can anyone send me or post the schematic of the tone-press if it's still available? Was this a request or an offering? Did I miss it?